Chris Magno is a doctoral student and teaches Radical Criminology in the Department of Criminal Justice, Indiana University Bloomington. He is now writing his dissertation on how crime becomes political capital in Philippine politics. He is the author of the book Corruption and Revolution: Joseph Estrada and the Uprising of the Urban Poor in EDSA III, soon to be published by Ateneo de Manila University Press. “Criminal community” is the popular identity of a place within the larger urban poor region where I conducted research for my Masters Degree at the University of the Philippines. Although I completed my thesis after one year of living and working in the community, I am still contemplating how the community acquired the image of criminality. The community is located on the public land of North Triangle, Barangay Pag-asa Quezon City, in the Philippines. It is surrounded by many governmental, commercial, and transportation establishments. Despite the fact that the community is surrounded by commercial establishments, governmental social service offices, and headquarters buildings, 60% of the adult members of the 5,000 families (as of 2001) who live in the community are unemployed, 40% are employed. Seventy percent of the employed work in private companies, 25% is self-employed and 7% work in governmental offices. All of the people who live in the community lack security of housing, 70% have no health care and, and 30% of the children ages 5-16 are illiterate. Among the unemployed, the most common modes of survival include prostitution, pick-pocketing in the nearby mall, stealing, drug dealing, and illegal gambling games such as jueteng. The community started to gain its criminal identity when President Ferdinand Marcos criminalized squatting through Presidential Decree 772 in 1975. During this time, the North Triangle community experienced demolition and the burning of their houses. Many were put in prison for violent resistance against demolitions. When P.D. 772 was repealed after the lifting of martial law, the community’s criminal identity was retained and reinforced by the illegal activities of some community members in surrounding establishments. For example, a gang member who lived in the community killed a Philippine Science High School student for refusing to surrender his wallet during a robbery. There were also weekly incidents of hold dapping of buses, taxis and jeep-neys (Philippine public transportation) that stop around the community. The image of criminality has a huge impact on the lives of the community. The daughters of a resident named Sonia, for example, were not accepted as sales clerks in a nearby department store when its human resources officer learned that they were living in North Triangle. Teodora’s son was not accepted in Philippine Science High School even though he passed the school entrance exam and had a high GPA. I also observed that Catholic residents cannot go to church in nearby high class subdivision because they are usually halted by community guards and chased by dogs. Most of the time residents cannot acquire care in the highly specialized hospitals because they are not capable of paying the required deposit, which only residents of upper level subdivisions can afford. Despite the criminal stigma that robs community residents of many opportunities, they survive through the services of politicians, professors, nuns, priests, seminarians, students, non-governmental organizations, religious organizations, medical practioners and social movements who go into the community with different agendas but the same objective of “helping”. Professors and students from exclusive schools visit the community for their research and provide tutorials to members of community youth organizations. Catholic seminarians from San Jose Seminary and Saint Francis of Assisi teach catechism classes throughout their immersion in the community. Medical students in the hospitals surrounding the community use it as a laboratory for practicing medicine under sponsorship of the community’s medical mission. Churches in nearby subdivisions such as Phil-Am usually distribute used clothes and groceries to the community every Christmas and conduct a Catholic catechism class among its youth every summer. Non-governmental organizations organize the community to attain their collective interest of security of housing, which, until now, remains a goal rather than a reality. Politicians sponsor mass weddings, mass baptisms, sports festivals, and celebrations of birthdays. After the students become professionals; researchers earn their degrees, medical students become doctors, nurses, and therapists; professors become prestigious in their research; seminarians become priests; religious and corporate organizations become famous philanthropists; NGOs receive plaques of recognition for serving the community; and politicians become popular and win elections, the situation of the community remains the same. Its residents remain poor, squatters, and stigmatized as dangerous and criminal. The community’s poor condition and lack of opportunity due to the stigmata of criminalization made them more dependent on the specialized knowledge, capabilities and resources of outsiders. The multiple practices of helping do not have the motive to uplift the condition of the community or even change its criminal identity, because this criminal identity, as David Campbell (1998) explains, is instrumental in the rationalization, normalization, moralization, correction, civilization, punishment, discipline, disposal and formation of society. Chris: Interesting and important research. Thanks for telling us about it. As you suggest, the naming process shapes identity. One reason we need good writers and good researchers. Keep up the good work. Chris, your post gives us insight once again into the sad fact that stereotypes remain highly toxic-everywhere-and how the negative ones especially still shape and ruin lives. The more we read about such things (and the more writers write about this, as Bob suggests), the more the word will spread that stereotypes do not make the the person. As soon as I met Chris during his orientation into IU’s doctoral program, I invited him to describe his own experiences in the Philippines. One question I wonder about is how much better life in this neighborhood than in prison? Under conditions that miserable, when stigma makes escaping that difficult, crime becomes a viable alternative. If you get caught and go to jail, are you that much worse off? There is no possibility of fighting crime without fighting poverty first. And poverty is not always a result of bad luck or personal failings. Jobs and resources are deliberately removed from poor neighborhood. Corporations need a destitute population willing to work the lowest possible wages, especially in third world countries. The article reminds me of our “expeditions” during the preliminary researches we did during the KHF days. I am proud that gave me the opportunity to be a humble part of this extravagant work. The article reminds me also of the same question I have been asking for decades now. What constitute criminality and urban delinqency. are they culturally-laden, based from the lifestyle of the people that live in a community or are they structurally made, spawning from the roots of certain social systems that tolerates criminality in its strictest sense. Nevertheless, the article substitutes a certain degree of analysis on how the urban poor makes use of these levels of criminality: against other (horizontal violence) or for the benefit of thier end. After reading Mr. Christopher N. Magno’s article above, I realized that the image of society is extremely important for lives of those who live in that society. That is, impression on an individual from other people’s point of view can vary, which his or her background takes a large portion of it. A social background is not the one which an individual cannot determine. It can be a positive stimulant for one to dream for better life and social status but he or she has to bear biased people’s viewpoints. It is nobody’s fault but the problem is based on unfair and false social structure. In the article, a society which is regarded as a community surrounded by crime is well described. “All of the people who live in the community lack security of housing, 70% have no health care and, and 30% of the children ages 5-16 are illiterate. 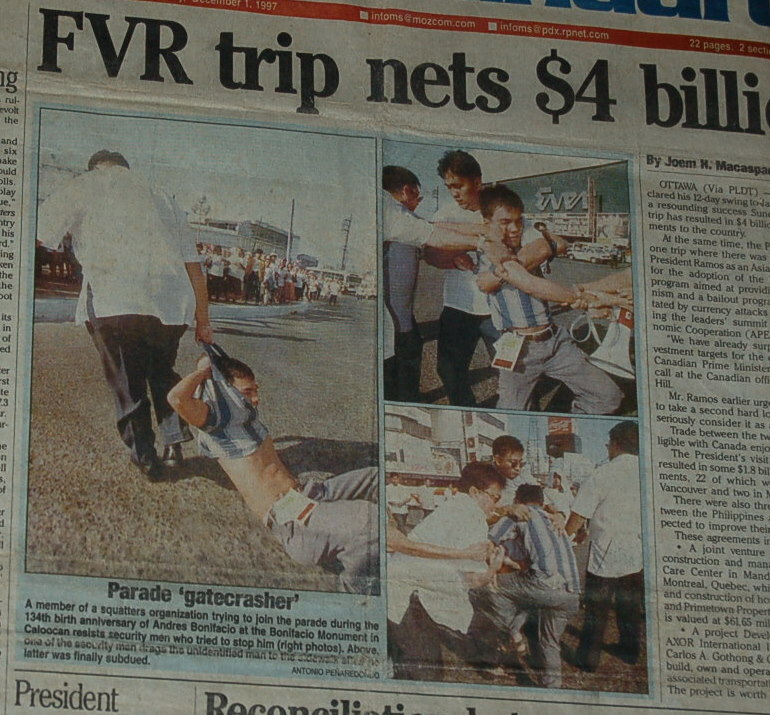 Among the unemployed, the most common modes of survival include prostitution, pick-pocketing in the nearby mall, stealing, drug dealing, and illegal gambling games such as jueteng.” Some people might argue that members in that community have potential to be criminals and background is more important than anything to determine one’s personality or ability. However, background is a given factor for those who belong to the community. It is not entirely an individual’s responsibility on committing a crime under desperate circumstances and it is a government and society’s duty to provide consideration and solutions on their hardships. There is also another interesting point which Chris mentions in his article – although people like researchers, medical students, professors, seminarians, religious and corporate organizations, NGOs, and politicians receive compensation on their service to the community, the situation of the community remains the same. Its residents remain poor, squatters, and stigmatized as dangerous and criminal. There is a gap which people in that community cannot overcome the current situation by themselves. It is a social problem. Under capitalism, many people now enjoy improved livelihood and pursue for more wealth and happiness. As every individual on these days has a right to pursue for better life, a situation given to the “criminal community” as referring to Chris’s expression in his article should be considered as a social problem and crime. Receiving limited opportunity compared to others only be his or her background is not justifiable and should be eliminated. Unfortunately, we still observe cases above on these days in many parts of the world. The article is familiar to me as well since the case above still exists in Korea, too. Such biased viewpoints of others toward a “criminal community” cannot be changed easily without having more comprehensive understanding on people who live in that community.